Very possible and remember the Rupp effect on officiating. I think the last time we got a call was 1976. That is where I have us. I think we drop one to UK (likely @Rupp), @lsu, and @Auburn. I have been saying we should be happy with 4-3 in our last 7 and I stand by that. I hope you're correct. Just don't be shocked if/when you aren't. Why are those the only two that you talk about? There are a bunch of statistical projections out there with much higher recognition than these two. I agree. Our toughest stretch of the season is coming up. I guess I will settle for 4-3, (I'll have to) but I'll be happy with 5-2 in those seven as long as we don't lose both UK games. We gotta at least split with the Kats. And quite honestly a loss or two toward the end may help our tournament chances, give us a little drive, put some extra pep-in-the-step. Vol fan way, they do it every football season too...season ends and it’s “next year we’ll be 5-7”, after O&W game it’s 7-5, then after fall camp it’s 8-4 and maybe even 9-3...happens every year. Yep. Personally, if we make it to UK at 23-1, I will be thrilled with a 4-3 finish to go 27-4 and 15-3 in the SEC. My concern is that our new influx of “fans” will turn quickly if that happens and start throwing out phrases like “hit a wall”, “mental toughness”, “overrated”, “Barnes teams always fade”, etc. Our conference schedule has been very kind to us so far. That is about to change. 4-3 would be a heck of a finish. Going 27-4(15-3) with loss on a neutral court to Kansas, @Rupp, @lsu and @Auburn would matchup with just about anyone’s resume in the country...not much to be ashamed of there. At the begining of the season, if you had said.....instead of playing the games, Tennessee can just take a 27-4 record and head into selection Sunday....I would have taken it and not even cared who the 4 losses were to. However, after watching the Vols this season, I don't see who they lose to. Sure, you nailed the obvious most likely possibilities and add in Kentucky In Ktown. I do think they are going to run the table, as crazy as that sounds, but I don't really care either way. Tennessee has done everything it had to do for the regular season. If they drop 3 or 4 more....no big deal. Just be ready to play when it matters. Would love to see a second SEC regular season championship, and despite hoping the eventually cancel the SECT.....it would be awesome to hang one of those banners in the rafters too. But for these Volunteers......only March matters at this point. You are good enough to win it....now go do work. I’m gonna play devils advocate for a minute, who has Tennessee beaten? Now, to Tennessee’s credit they’ve beaten the teams in front of them, but the first 23 games had 3 Top 40 opponents, the final 8 games has 5 of those, 3 of which are on the road. I guess my point is that many people are basing the fact of 5-2 or running the table on our 20-1 record, but would we be 20-1 if our conference schedule was more balanced? What if we had 3 of these 5 games earlier in the year and we lost 2 of them, so we currently would be 18-3, would people still expect us to run the table? We are good, there’s no doubt about that, but so is Duke and they lost to Syracuse, if Tennessee runs the table they’d join the discussion of all-time greatest CBB teams in the last 20 years, and probably have a case against any of them, I’m just not sure they’re THAT good (especially given the weak defensive numbers). Tennessee is typically worse vs. teams that allow opponents to shoot well from the field. Against foes that have a defensive field goal percentage vs. AO greater than 41.91%, Tennessee performs above their norm 11% of the time. Against the remaining opposition, the team performs above average 67% of the time. When facing teams that do a nice job converting inside the paint, Tennessee often performs better than normal. Tennessee is more efficient than usual 75% of the time when facing teams that have an offensive near-proximity field goal percentage vs. AO greater than 62.70%. In their other contests, Tennessee performs better than the norm 23% of the time. Tennessee does worse vs. clubs that allow more chances at the line. When playing squads that have a defensive free throw attempt rate vs. AO greater than 25.49, Tennessee performs above average 23% of the time. Against all other opponents, the team performs better than the norm 75% of the time. I can understand why our 'momentum' rating has slowed in terms of efficiency vs the way we started the year and SEC play, but I would think a 16 game win streak could be considered good momentum. However I do not understand how we can rank poorly in consistency... unless perhaps there are a lot of consistently bad teams.. I don't think you are wrong. There is no question that things are about to get a lot harder....even if you only look at the regular season. Add in the pressure that will be on this team to win the SECT and then the obvious pressure of the NCAAT....it's going to get interesting, and there is no question that we will have a much better idea of who this team is in a couple of weeks. I honestly think we will know everything we need to know after next Saturday.....road game, conference rival, Top 5 team, historically hostile environment....that's as hard a game as they will face all year, including the tournaments. I just see an unwillingness to lose in this team since Kansas. You could see the disappointment after that game, and I think some of our closer games have shown the maturity and ability to pull off games that we would have lost last year. We will know soon....either way, I don't think I have ever seen a basketball team more fun to watch, and I am just going to enjoy the ride. Interestingly, realtimerpi.com has the Vols losing by 5, 82-87, with a probability of a Kentucky win at 1.5 to 1, or a probability of 66.6%. Warren Nolan predicts a Kentucky win by 74-75. Realtimerpi.com`s predictions, especially late in the season, tend to be very accurate. But they do not account for the heart of a team or the quality of a coach. Vols win this one. IMHO, the Vols can beat Kentucky twice, Auburn and LSU. I think the next loss will be against a team that blindsides the Vols. I think we sweep Kentucky fairly easy. at lsu is going to be trouble. I don't like the MSU game either. Here is an update comparison of Realtimerpi.com and WarrenNolan.com predictions. Interestingly, realtimerpi has increased the extent of the predicted margin (a 5 point margin in favor of Kentucky) by which UK will win this evening's game. It also predicts that UT will lose 4 of the next 7 games. 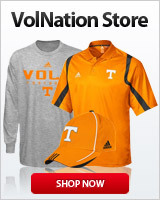 Warren Nolan has not adjusted its predictions of UT's victories. Historically, this late in the season, realtimerpi has a very strong predicitive record. My problem is I do not buy it. The balance, heart and coaching of this season's Volunteers will show. The Vols will win. I like numbers but sometimes they can bog you down. It’s hard to show in stats how Tennessee has basically dominated the last 6 teams by playing journeyman basketball. I think this team is capable of playing at a higher level than any other team in the NCAA. If Tennessee plays it’s A game tonight, it will be a 12 point win. Out of curiousuty do you know what data realtimerpi uses to predict? Realtime now has them losing @KY, @lsu, @Miss, @Auburn.